The world championship battle between Magnus Carlsen and Fabiano Caruana will be decided in a quickfire tie-breaker after Monday’s Game 12 ended in a 31-move draw. The result shocked onlookers in light of the champion’s advantages in position and time, and left the best-of-12-games match in a historic 6-6 deadlock. 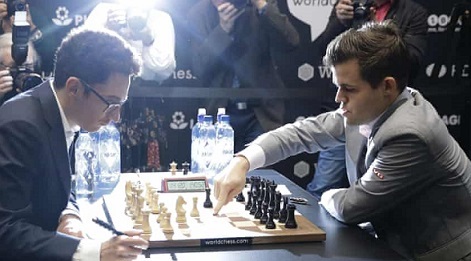 The 27-year-old champion from Norway, making his third defence of the title he captured from Viswanathan Anand in 2013, will play as white in Wednesday’s first tiebreak stage after a drawing of lots following Monday’s game. The tiebreak will consist of a best-of-four rapid match with 25 minutes for each player with an increment of 10 seconds after each move. If that is not enough to break the deadlock, they will play up to five mini-matches of two blitz games (five minutes for each player with a three-second increment). If all five mini-matches are drawn, it will come down to one sudden-death ‘Armageddon’ match in which white receives five minutes, black receives four minutes and both will receive a three-second increment after the 60th move. If that game is drawn, black will be declared the winner. And you thought your life was intricate.